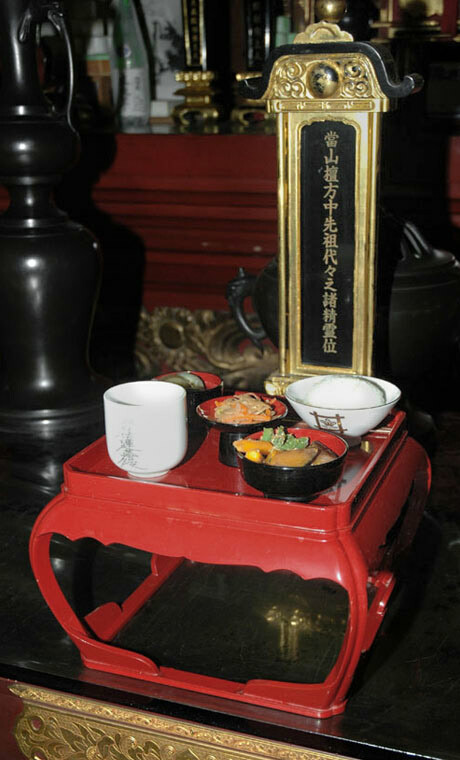 The Butsudan is a family altar. The Butsudan in a Buddhist’s house is like the cross in a Christian household. It is very important to us as Buddhists, so we would like to tell you about the Butsudan and role it has in our practice. The Butsudan is like the Buddha’s house, and is the altar dedicated to Dai-Mandala (the object of worship), the Buddha, Nichiren Shonin, and our ancestors. The Butsudan also shows us the Buddha’s world. It is usually box-shaped, but there are many different kinds of Butsudan. No matter what shape, size or color the Butsudan is, the most important thing is to dedicate it to the Buddhas and others. We sometimes see only the Buddha’s statue on the shelf. That is not good because the Buddha is not just an artistic statue, but the object of worship for Buddhists. We sometimes put a beautiful doll in a nice glass case. Why do we not take better care of the Buddha and others, much more than just a doll? We should treasure the Buddha and others as the object of worship with the Butsudan. Why should we have a Butsudan? The Butsudan expresses the owner’s faith. The Butsudan at home means that Buddhism is very close to a family. The Butsudan leads the family closer to Buddhism. In addition, the Butsudan also shows us the relationships between the Buddha, Nichiren Shonin, and our family, including our ancestors, and shows the Buddha’s great world in which Nichiren Shonin and our ancestors live. The cross, on the other hand, shows us only the relationship between God and the present family. In other words, the Butsudan is the window between the Buddha’s world and this world. If we have a Butsudan at home, we can see the Buddha, Nichiren Shonin, and our ancestors whenever we want. When sitting in front of the Butsudan with gassho, we can see our parents, grandparents, and other ancestors enjoying their lives in the Buddha’s world, and we can fully realize the salvation and compassion of our Lord Buddha.